BlytheLife.com » Another doll love besides Blythe. 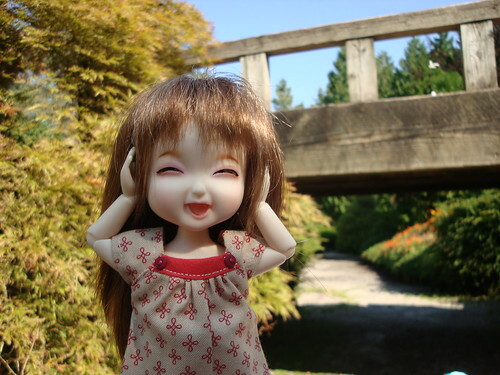 When I first started in the Blythe community, I noticed that a lot of other people had dolls other than Blythe. I thought some of them were pretty cute, but I also thought it’d get very expensive very quickly if I were to indulge in other dolls. But there’s just some things that you just can’t shake. And sometimes, just sometimes, you fall in absolute love with a dolly and just have a need to get her. This little dolly belongs to a member of my local Blythe group, Jen. My first mistake was asking if I could see her/hold her. The second mistake? Posing her arms and legs. It didn’t take very long for me to find one online to buy. It also didn’t take very long for the doll arrive in my grabby little hands (yay for EMS!). And now I have my own ball-jointed doll to call my own! My sisters were impressed that it look so long for me to branch out into other types of dolls. It was difficult for me because I had to find a way to reassure myself that this wasn’t the beginning of the end of my bank account (!) and that it really was mostly a one-off purchase because I can’t afford to clothe multiple sizes of dolls and I really don’t want that many dolls! Blythe will always be the number one dolly in my heart, but there’s always room for more dolly love to go around. 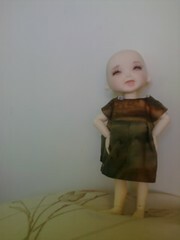 For those that are curious, this doll is a Doll Leaves 16cm ball-jointed doll with the stock name ‘DingDing’. The model was discontinued before I bought her, so you won’t be able to find her on the Doll Leaves website, but you can still find her online at various resellers or on eBay. QOTW: The largest your family has ever been? Question of the Week: The maximum you would spend on a doll?